The inversion of the yield curve last Friday produced lots of concerns among investors. However, the historical evidence is not conclusive at all when it comes to the relationship between inversions and bear markets for stocks. That notwithstanding, investors should always have a plan for portfolio protection in a bear market. 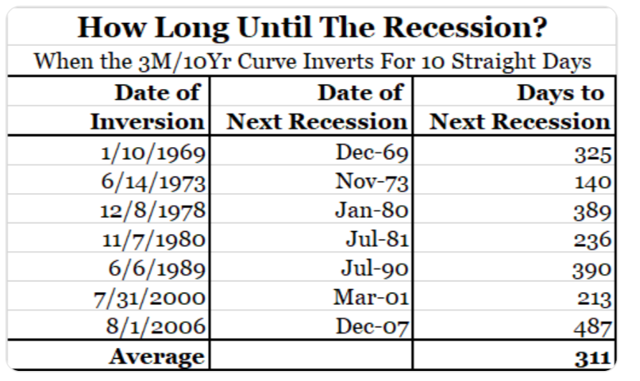 Looking at the US economy over the past several years, in seven out of seven occasions, an inversion in the yield curve has preceded a recession. But, on average, it took 311 days since the inversion and the start of the recession. This means that the shape of the yield curve is hardly an effective tool to time the economy. Besides, there is no such thing as an infallible rule when it comes to predicting the economy or the stock market. The future is always a matter of probabilities as opposed to certainties, and the data should always be interpreted in its due context. Especially when we have a small number of observations to work with. The pessimistic explanation for the inversion in the yield curve is that long-term interest rates are falling because investors are expecting a deceleration in economic growth in the future. This may well be the case, and there are lots of reasons for concern considering that the economic cycle in the US is getting quite extended. But we also need to keep in mind that financial markets are deeply interconnected nowadays. Interest rates in Europe and Japan are staggeringly low, even countries such as Spain and Portugal, which had serious debt problems in 2011 are now issuing debt at negative interest rates. Based on closing prices from last Friday, a 10-year bond from Japan is yielding a negative -0.71% and a 10-year bond from Spain yields 1.09%. Importantly, both Japan and Spain are having serious difficulties in terms of insufficient economic growth and excessive government debt in recent years. The way I see it, a 10-year US Treasury bond yielding 2.45% looks like a much stronger bet than bonds from Europe and Japan. As global investors look for opportunities to put their capital to work across the world, it’s only reasonable to expect more money flowing to US bonds as opposed to Europe and Japan, which should obviously push US bond yields lower. In other words, the recent inversion in the US yield curve could be due, at least in part, to the fact that yields in other countries are ridiculously low, which makes US yields comparatively more attractive. There is a reduced number of instances of yield curve inversions in the US over recent years, so it’s hard to reach valid conclusions from such limited evidence. 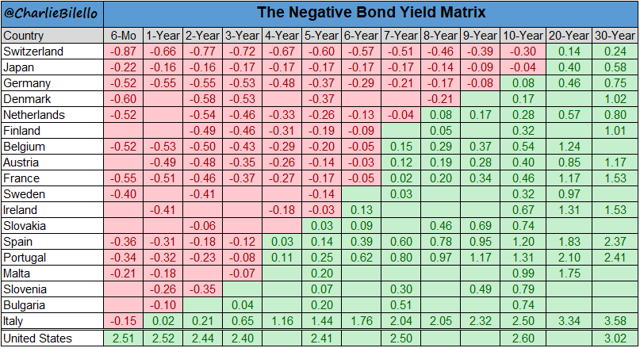 For this reason, the analysts at Dimensional have compiled the relation between yield inversions and subsequent market returns in different countries over the past 40 years. In 10 out of 14 cases of inversion, local investors would have had obtained positive returns investing in those markets after 36 months. Performance metrics after inversions are roughly similar to the historical returns in these markets, regardless of the shape of the yield curve. According to the available data, trying to predict the direction of the stock market based on the shape of the yield curve doesn’t seem like a good idea. There is no evidence to say that an inversion in the yield curve will necessarily bring a bear market for US stocks. However, that does not change the fact that sooner or later we are going to have a bear market. That is just the nature of the game, you can’t expect to enjoy the upside potential in stocks unless you also are willing to accept some downside risk from time to time. Even worse, bear markets usually show their ugly face when least expected. There are many ways to build a plan for a bear market, and all the different possibilities have both weaknesses and strengths. The most important thing is that such a plan must be realistic and consistent, and it has to be the right plan based on your own needs, risk tolerance, and time horizon. Assuming that you are going to predict the bear market before it comes is simply not realistic. The data has proven time and again that even the most renowned professional managers with access to massive resources and information fail miserably in their attempts to forecast market gyrations. Playing this game is a losing proposition. Buy and hold investors generally plan to hold on to their stocks during bear markets. This strategy can make a lot of sense in some cases, but it also carries substantial downside risk. The chart shows the different drawdowns for the S&P 500 index after 1971 and how long it took to recover the capital after those drawdowns. 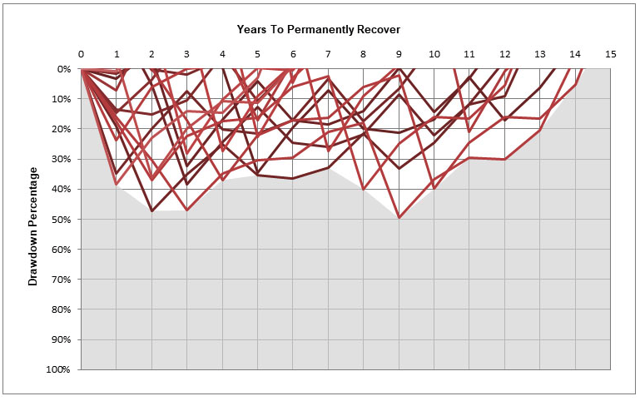 As you can see, it’s not uncommon at all to have drawdowns that take between 5 and 10 years to recover. Sometimes, it can even take as much as 14 years to recover from market drawdowns based on historical evidence. It’s one thing to look at the historical chart and think that you have the fortitude to tolerate bear markets, but a deep and ugly bear market feels much harder when you are facing it in real time and with real money. Many investors tend to overestimate their true risk tolerance. Besides, sometimes, you just don’t have enough time to hold on to stocks for so long. Another alternative which can be very effective is applying trend-following strategies for portfolio protection. In essence, trend-following means that you only buy an investment when its price is rising. Many trend-following detractors believe that the strategy is about buying high and selling low, but that is a misconception. In truth, trend-following is about buying when the price starts rising and selling when the price starts falling. The following chart explains this key distinction in brilliantly simple terms. Trend-following strategies are entirely rules-based, many times using quantitative indicators such as moving averages and momentum to protect the portfolio. This article explains how some of those strategies work and what kind of returns and downside risk you can expect based on the backtested performance numbers. The point is that there is no prediction whatsoever involved in the process, you just build a plan and execute based on the current data about trend and momentum in the market. No strategy can be perfect or infallible, and trend-following generally underperforms versus buy and hold when market adjustments are short-lived and shallow. However, the evidence shows that these strategies tend to deliver market-beating returns over the long term, and they are remarkably effective at providing capital protection during bear markets. An inversion of the yield curve could be signaling some problems in the global economy, but there is no guarantee that such inversion will produce a bear market for stocks. In fact, not even the most renowned experts can accurately forecast market gyrations. As opposed to making market predictions, investors should focus on developing and sticking to a long-term plan that is in line with their risk tolerance and needs. Buy and hold is a reasonable approach to consider, but holding on to stocks during tough bear markets can be much harder than it seems to be. Trend-following strategies, on the other hand, can produce disappointing returns in sideways markets, but these strategies do a solid job at protecting your capital when prices are moving deeply in the wrong direction. Relying on objectively quantified strategies with a strong track record of performance is a sound approach to protecting your capital in the long term.